The Beara Peninsula, otherwise known as the Ring of Beara, is a place where ancient landscapes and changing skies welcome the passionate traveler. 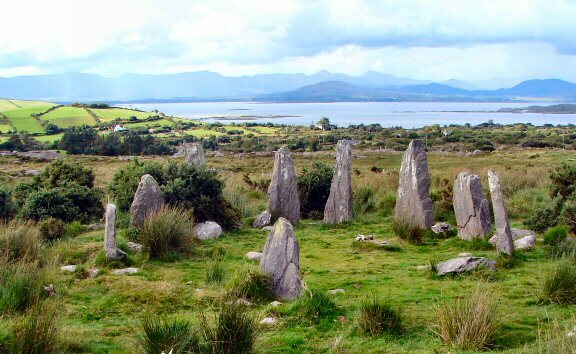 Discover mysterious stone circles, wedge tombs and standing stones. Explore wild beaches and rolling hills. Enjoy the music, great conversation, and company of friendly people in colourful towns. The Beara Peninsula holds the spirit of Ireland within its rugged beauty. I am new to fishing and would appreciate any help. wow. thanks for sharing the awesome photos. beautiful!!! Hi, thanks for the beautiful pictures and Info you share. Many of my MARTIN Family worked, Married had families while working in the Mines, then some went to Australia and new Zealand to work in the mines there. I have been in contact with several there in the last few months. I have been to Ireland several times , but did not know of my connection in Berehaven, I would like to communicate with you if possible?. I am 80 yrs young and learning more each day. Beautiful blog. Which stone circle is pictured on this page? Hello, and thanks for writing! This stone circle is known as both Canfea and the Ardgroom SW stone circle. (on a side note, for those of you still waiting for responses from me, it’s taken me weeks to finally get back online but I’m back and will be writing a.s.a.p.) Thanks for visiting!! Many moons ago (hell, four decades, even) I made the Ring of Beara unsafe on a 250cc Matchless motorcycle. A single cylinder thumper, named, for same unfathomable reason “Bam-Bam”. I read poetry, devoured the scenery, and reflected on quiet sunsets on deserted beaches. I was young then, full of beans & illusions, and now I’m getting old, borderline barnacle encrusted, in the great state of Texas. I shall be visiting Beara later this year, for a quiet prowl, with a view to hunting down a long standing dream: a quiet cottage, with a sea view, reasonable Internet, where this old codger can retire, and indulge in his passion: wandering over the hills, indulging in endless dreams, and never ending scribbles. Thank you for the photos. Ah, yes… I remember.